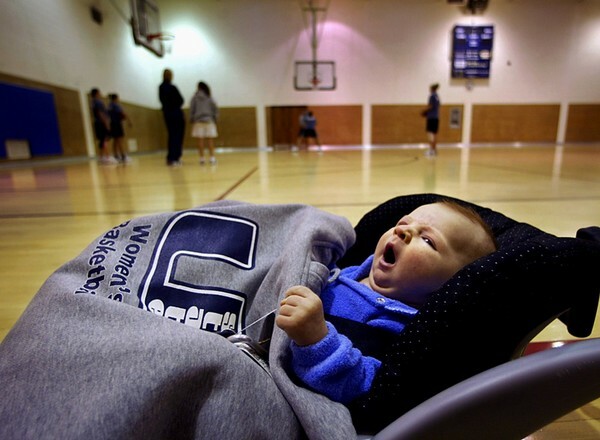 9/26/03 --- UTAH STATE WOMEN'S BASKETBALL TEAM --- LOGAN, UT: Joe Peebley, head coach Raegan Scott-Peebley, yawns as he waits for his mom to finish a workout with a couple of players. Joe goes to school with his mom in the mornings and is watched by a student during practice. Utah State announced it was reinstating women's basketball on March 5, 2003. Utah State dropped women's basketball after the 1987 season and was one of three Division I schools that did not field teams last year along. Photograph by Robert Hanashiro, USA TODAY.